Students from the news group went on a field trip to the Times Herald Record in Middletown. Paul Schultz explained that they print approximately 50,000 papers per hour and the facility is used to print over 130 different publications worldwide. He also explained that everything there is recyclable including the ink that is used which can make biofuel. 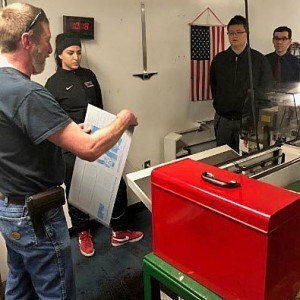 The printing process consists of four colors and each color is given its own “plate.” Each plate has a polymer layer that is laser cut and then used to make images containing that specific color. If each roll of paper used could be totally unraveled it would extend 7 miles. It takes 17 trees to make one roll and it takes 20 minutes to print an entire roll. In keeping with their commitment to being eco-friendly, they plant a tree for every tree they consume. NYMA is very grateful to Paul for taking the time out of his busy schedule to explain how their operation is run. The students asked many questions and were amazed at how enormous the machines were and how complicated the printing process actually is. The culture group was assisting in preparing a meal in celebration of Mardi Gras. The menu consisted of chicken gumbo soup, crab cakes with Creole sauce, Orleans red rice and beans, Creole roasted vegetables, and bread pudding. Next Next post: HVAL Champions!